Installing a system in the Core 3300 is pretty easy. The removable drive plate makes installing those easy, but they do need to be installed in a specific order. If you will be installing both 3.5″ and 2.5″ drives, the 2.5″ drive must be installed first, as the screws are covered up by the 3.5″ drive. All data and power connections will be towards the front of the case on the installed drives. This is nice to help hide them, and route them out of the way. There is plenty of room for graphics cards (GTX 760’s pictured). The cable cutouts are in good locations to help power these as well. Installing a watercooled system into the Core 3300 was not too bad. The drive plate made for a convenient place to install a tube reservoir. Though the XSPC Photon 250 was a little long for the case, it worked nicely in this location. I also used a 30mm thick 240mm radiator in the front, and a D5 pump with a pump-top on the floor. 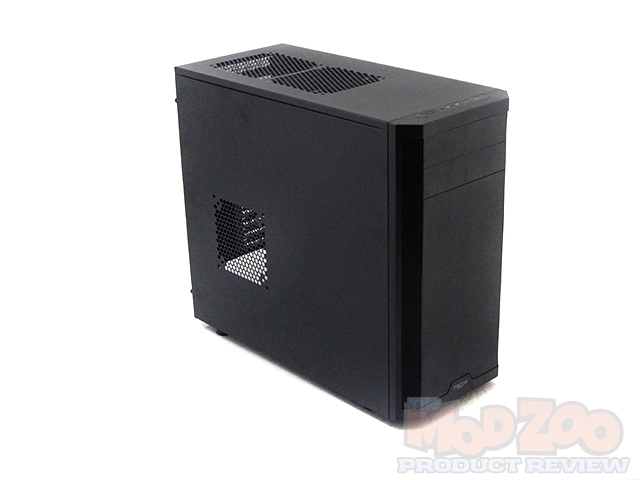 Great review, and great case Thank you Mos!